Ms. Amatuci has advanced alternative plans in the past, and the last one featured the Library campus as well. I’m not enthusiastic about the location, or picking a fight with the Library Trustees, nor do I believe the cost estimates being thrown around are realistic. The lead off warning is exagerated a bit. A 20 year $4 million bond at 4.5% will cost an average of about $290,000 per year. The proposed, but not guaranteed $3.25 million bond would cost about $236,000 per year for 20 years. About $309,000 the first year and about $170,000 the last year. But inept as the arguments may be, they have substance. I’ve argued that for the equivalent of the first five years of bond payments, we could completely renovate the existing offices, pay as you go, without incurring 15 additional years of debt. All through smaller, arms-length projects that avoid handing huge sums of money to a group with a horrible track-record to date. We need a plan that addresses the concerns of both sides of this debate. Fixing the offices and major building issues should be something the Friends could live with. Keeping the project on a short leash and checking in with the voters each year should be acceptable to those who don’t trust the Friends with a blank slate and a big bag of money. That’s where Selectmen Senecal and Harriman are leaning. Otherwise, in the end, they will have separated us from the $6.8 million that we rejected so emphatically back in 2008. After reading the latest round of Letters to the Editor in our local tabloid I get the unnerving feeling the Friends of Brewster Hall, their colleagues, and the BOS members they influence now feel they have a head of steam and see the light at the end of the tunnel with regard to a successful outcome for the Warrant Article. My fear of course is that it is not the light at the end of the tunnel they see, but a train coming the other way and on track to run over them and every other taxpayer in Wolfeboro. While somewhat fragmented Suzanne Ryan’s detailed letter published in the Grunter in concert with your recent posts relative to the very critical structural integrity of the roof system leaves me not only puzzled but disappointed that the elected and self-appointed leadership on this article do not have the common sense to step back, validate once more the most critical, and potentially the most costly, construction issues involved with a renovation of this scale and provide the voters with a balanced choice on election day. Granted the concessions made in the scope of work to reduce the “budget” by three million bucks or so is admirable, the efforts used to railroad this Article through (there I go again with the train analogy) without meaningful conversations about the “What ifs?” concerns me and should concern even the most ardent but silent supporters of this Article. I am fairly certain that we would have a unanimous vote from the BOS to support this Article and not a 3-2 split underwritten by some experienced members of the Budget Committee if there were no concerns about the final outcome of this project for the consideration given. Eight-hundred grand down, six plus million to go. What a country! 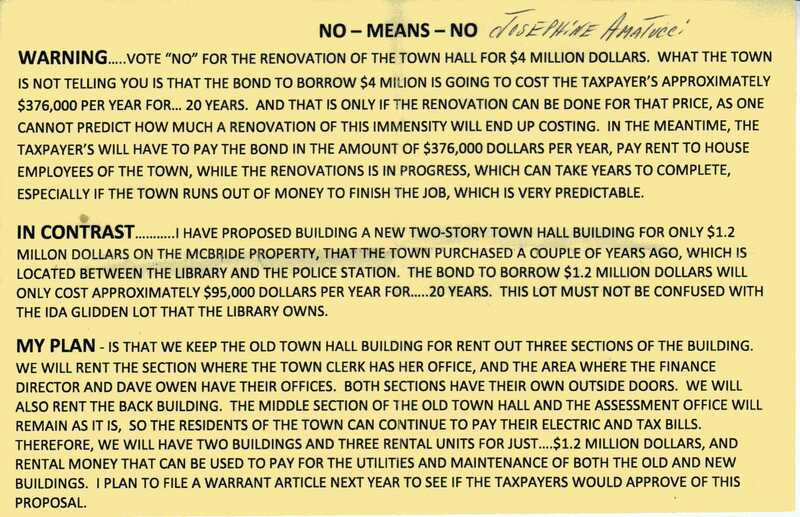 It just amazes me that the Brewster Memorial Hall -Town Offices drama is back on the ballot again this year for $4 million dollars. How is it we continue to allow the few dozen members of the “Friends” to promote the strident, narrow and selfish position they have embraced for the past eight years? If we look at the Town of Kensinton, NH, just 25 miles south of us and study how they faced the same issue and, how they are resolving it for $1.2 million dollars, it makes me wonder what certain Wolfeboro Selectmen are thinking. Go to http://www.town.kensington.nh.us/, click on “CAN BE FOUND HERE” and weep for our Town and us taxpayers. I urge all registered voters to make your feelings known on this important issue in the Town election which will be held on March 11, 2014, from 8:00 A.M. to 7:00 P.M., in the Undercroft of the All Saints’ Episcopal Church, South Main Street. Join the two dissenting Selectmen and several Budget Committee members who could not support Article 7 in voting “NO”! If we can just get more voters out this year I believe we can finally advance towards…what will be. than the TM saying something to the effect it is his responsiblity. If you read 2/27/14 page 18 of the GSN Town Mtgs report you will see “what will be”. the ablity to manage such. The real mismanagement of that project occurred more than a year ago when the CIP committee decided to reduce the amount requested by the Parks and Rec dept from, I think it was $260,000 to $200,000. The result was a scramble to cut corners and go with the lowest bidder. The Parks and Rec dept had brought them building plans and reliable estimates. The CIP didn’t say build a smaller building. They said build this building for less. I can’t think of a single person on that committee who is qualified to make that determination. Needless to say, those same folks don’t have any problem with spending $4 million on Brewster Hall.